All the basic barcode questions are answered below. Everything you wanted to know is here, plus a little more at no extra charge. Click a question to expand the answer. Contact us for more detail or to schedule a GoToMeeting web demo. You can use any word processor or spreadsheet to print labels. In fact, any program that can print can incorporate barcode labels. Simply use a barcode font for the text you want on the label. First select the text, and then choose the font. The results will be a label you can print. But you must first install a barcode font, which you can download from the internet. Is there a barcode font to download? Yes, we recommend the IDAutomationHC39M_FREE.otf font, which you can download from the link below. Why do barcode labels use an asterisk at the beginning and end? The asterisk tells the scanner where the label physically begins and ends. Think of them as bookends with text between them. The scanner does not send these asterisk characters to the program. It only sends the text between them. How do I connect barcode scanners to my PC? Most barcode scanners connect to USB ports. Even wireless scanners have USB receivers similar to those used on keyboards and mice. Plug the scanner into any USB port, and it will work just like a keyboard. When you scan, the characters on the barcode label will be sent to the computer just as if they were typed with a keyboard. Can I connect multiple scanners to one PC? Yes, but beware that they may compete and collide. In other words, the program could receive input from both scanners at the same time. It would not “know” which text came from which scanner. So, we recommend one scanner per workstation or tablet for simplicity. Consider deploying inexpensive tablets instead of traditional PC’s for a simpler yet cost effective solution. If you must connect multiple scanners to a single PC, consider programming unique prefixes into each scanner so the program knows which text is from which scanner. But this prefix complicates the setup, and is not recommended. What barcode scans are needed to start a timer? Start by scanning your username. Then scan a project, and then a task. The timer will start. Depending on your configuration, you may not need a task, or you may need other required scans. But normally, a username followed by project and task is enough to start the timer. More advanced configurations allow you to scan other kinds of data that is unique to your organization. Those additional scans may be required before the timer starts. To stop a timer, begin by scanning your username. Then scan STOP. The timer will stop. You’ll notice that scanning your username first shows the status of the current timer. You’ll see when the timer is running, and when it was started. If you scan STOP, the timer will end. You’ll notice that the time log (in the Time Log view) will then show the stop time and actual work for that time segment. My timers start immediately after scanning a project, why? You may not have the program configured to require project tasks. If not, scanning a project is usually enough to start the timer. Requiring project tasks means that you must follow the project scan with an additional task scan. Only then will the timer start. If your projects have tasks, and you want to require the user to scan them before the timer starts use these steps: Choose File, Users and Organization. Right-click on the first item in the list and choose User Rights. Scroll down until you find: “Can log time with no project task selected”. Uncheck it. Click OK, OK, OK. 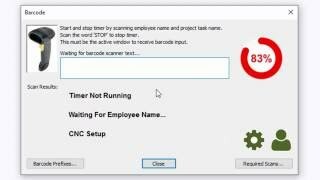 The program will restart and will then require employees to scan project tasks before the timer will start. Can you have multiple timers running at the same time? Yes, each user can have one timer running at any time. If the user needs to switch jobs or tasks, they must stop the current timer and start a new one. Multiple users means multiple timers, but each user has only one. Can multiple employees work on the same job? Yes, there are no restrictions to the number of users working on the same job or task. Can multiple employees work on the same task? Yes, multiple users can scan the same job and task. In this scenario, each user would have a timer, and those timers would be for the same job and task. How do I locate and change the name I scan? The username you are logged in as is shown in the upper-right corner of the main window. To see a list of all users or change your own username, begin by choosing File, Users and Organization. All the users will be listed. The icon for your username will have a small “check” next to it. Click any username and then rename it using the “Name” field. You will scan these names to start a timer. Can I add new employees that can scan? Yes, begin by choosing File, Users and Organization. Click the first item in the list, and then click the “Plus” icon in the toolbar. Now change the name using the “Name” field. Each user that scans barcodes or administers the program needs a license. You will scan these usernames to start a timer. How can I require users to scan project tasks? Choose File, Users and Organization. Right-click on the first item in the list and choose User Rights. Scroll down until you find: “Can log time with no project task selected”. Uncheck it. Click OK, OK, OK. The program will restart and will then require employees to scan project tasks before the timer will start. Work orders are normally represented by projects. Choose File, Project Wizard to create a new one. This wizard will also assist in creating project tasks. But if you already have an existing project with tasks that you have used for older jobs, you can duplicate it. Choose Tools, Projects to duplicate a project. Can I duplicate an existing work order? Yes, Begin by choosing File, Projects. Right-click on an existing project and choose Duplicate. This will create a copy of the project and all its tasks. You will see the results in the Project Tasks view. Scan these projects and tasks to start a timer. Can I use QR Codes? Yes, QR codes contain more information in smaller spaces than 1-D barcode labels. QR scanners work identical to red laser scanners. Just point and click. Tip: Because QR codes can include more information, you can use “multi-part” fields to collect more data in a single scan. Can I share a scanning workstation with all employees? Yes, but consider the option of using low-cost tablets for each employee instead. Multiple employees can share a single workstation or tablet, but they may need to wait for brief periods while other employees are scanning, which is one good reason to consider tablets for everyone. Where does the information go after scanning? The information first goes into the workstation or tablet the scanner is connected to. From there it normally goes over a LAN or Wi-Fi connection to a server. That server will have SQL Express or SQL Server installed. This is a shared database. The information goes into this database. Computers used by managers connect to this same SQL database, which allows them to see information immediately. This is how projects, tasks, and employee data is shared between PC’s and tablets. Can I run reports of my barcode scans? Time Log reports contain all the barcode scans. Actually, time log reports contain the time segments resulting from scans. These are the same records seen in the Time Log view. A time log contains a timestamp for when the timer starts, and another for when the timer stops. The difference between these timestamps is the actual work. It is represented in hours. Time Log reports can show how many hours employees work, the hours spent on a work order or task, and other information related to barcode scans. Are barcode scans available for reports immediately as they occur? Yes, as long as the barcode scans result in a timer starting or stopping. Normally, reports only show those time log records where the timer has ended. Completed time logs (with both a start and stop time) contain the actual hours for that time segment. Those are normally the ones shown on reports. Can I connect workstations using Wi-Fi? Yes, workstations or tablets can connect to the network with Wi-Fi. But more reliable connections are obtained with hard Ethernet wires. If your tablet doesn’t have an Ethernet connection, consider using a USB Ethernet adapter. This adapter plugs into the USB port on the tablet, and converts to Ethernet, which you can plug a hard wire into. 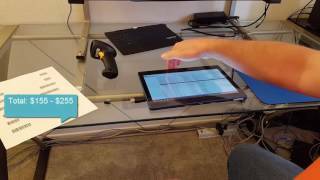 Can I use a tablet for a barcode workstation? Yes, tablets make great scanning stations. You won’t need a mouse or keyboard. You won’t need to sit down in front of them as you do a normal PC or laptop. You simply tap and scan. Consider bolting them down for protection and longevity. And, consider using screen protectors so the glass is not easily broken. Maybe. If you want to self-host on your own network, you will likely need a server. Any PC can be used as a server, but we don’t recommend somebody’s personal workstation because they may crash or reboot, which disconnects everyone else. It is better to dedicate the PC to serving rather than using it for personal work. But if you want us to host, we’ll provide the server. Our hosted servers are located offsite, and must be accessed using a web browser. If you host on-premise, you can connect using native Windows client applications or browsers as your needs dictate. On-premise hosting is the most versatile, but requires a server of your own and IT staff to maintain it. Is this program hosted in the cloud or on my own server? That is your choice. You can self-host on premise, or have us host. Either way works. Pricing is different for each option. Do I need a license for each workstation, or for each user? You’ll need licenses for each user. It doesn’t matter how many workstations or tablets you deploy. Licenses are for each person that scans or performs admin tasks in the program. One license per user. If I had ten employees sharing one scanner, how many licenses would I need? You would need ten. Licensing is based on people using the software, not scanners or machines. You can install the program on as many workstations or tablets as you need, and use as many barcode scanners as you need. There are no licensing penalties to deploying the software on many machines. What barcode scanners work with this? Almost any scanner will work. Most scanners use USB connections. That connection is the same as keyboards and mice. Scanners work by emulating keyboards. Simply plug them into any USB port, and scan. The results will come into the computer just as if you were typing on a keyboard. You can use simple red-line laser scanners, or the more complex QR code scanners. Both work the same. They both connect with USB, and both send text like a keyboard. No drivers are required. Just plug and play. Do you recommend a certain scanner? If you’re new to this, we recommend a “wired scanner” in the $20 - $30 price range. Buy them on Amazon. 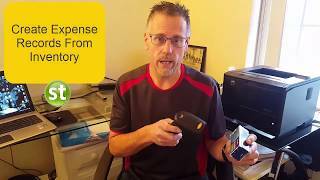 These inexpensive scanners give you a taste of what to expect without breaking the bank. 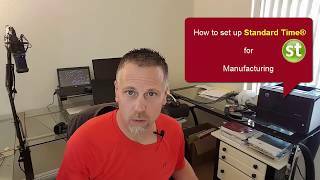 You can put them into production on the shop floor, but consider upgrading to ruggedized units as finances allow. Rough handling will diminish lifespan, so plan accordingly. Consider mounting the scanner on a stand so it is not mishandled and misused. Stands allow you to pass barcode labels under the scanner for instant results. 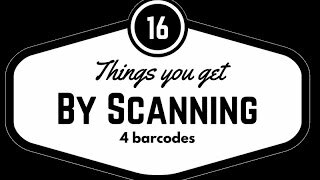 The best scanners for long-term use are those used in retail stores like Walmart and Home Depot, but they are expensive to start with. Do I need a “wired scanner” or wireless? Both work fine. And both have their advantages. Wired scanners are always powered, through the USB cable, whereas wireless scanners use a rechargeable battery. Having the scanner always powered is a strong advantage. It means you never babysit the power needs. It also means you can pass barcode labels under the scanner for immediate input. In other words, wired scanners are always ready to use. Wireless scanners are more mobile, with no cables to tangle, but they attempt to conserve battery life and sometimes require an extra trigger-tap to bring them to life. Plus, you’ll have to plug them in to recharge. Can I scan anything other than work orders? 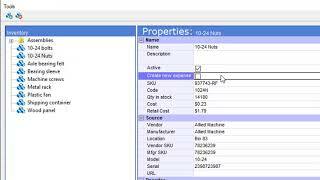 Yes, you can scan projects, tasks, phases, steps, status, inventory, BOM’s, expenses, scripts, tools, and many other items. You can even require special scans that are unique to your organization. 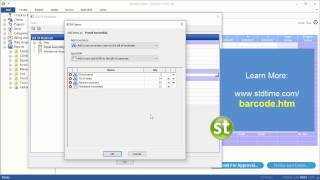 In other words, you could configure the program to scan a special batch number or department or machine or test result. Anything you wish to add to the scanning process is available to you. Almost all the data you scan is placed in the time log created by the timer you start. That makes it available for reporting at a later time. Can I scan offline and upload later? Given these risks, we highly recommend tablets or workstations that are connected to a server. Another option is to use our offsite hosted option. Can I start a timer on one tablet and then stop it on another? Yes, the data you collect from barcodes goes into a central database. All workstations and tablets have access to it. That means you can start a timer on one machine and stop it on another just by scanning the correct sequences. 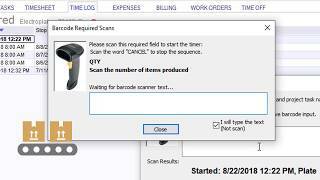 Is barcode scanning the only thing this program does? The program actually does a lot more. Scanning is only one part. 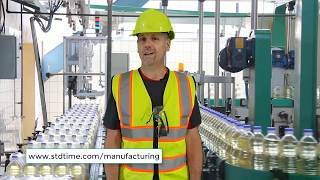 Standard Time® is a manufacturing resource planner (MRP). That means you can plan projects and tasks using built-in project management. Gantt charts and resource allocation charts are available. Tasks may be connected with dependencies, so you can plan future events based on resource requirements. The program also tracks employee PTO, and time off accruals.